Watch the video and then scroll down to see the sample code. This video tutorial explains how to connect joints in Maya when working with skeletons, and also how to add bones between joints. The video also gives an introduction to the parent-child relationship in Maya. If you haven’t already watched the video on creating skeletons, then click here to watch it first. 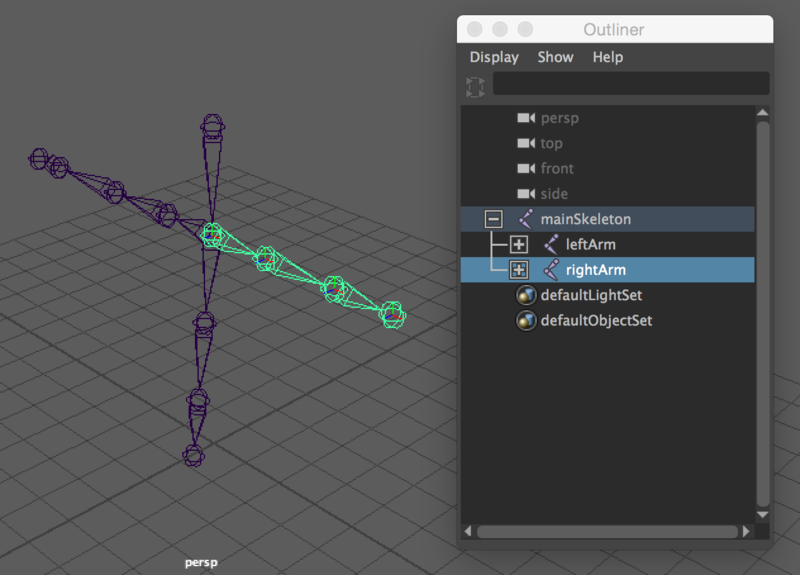 After connecting one joint to another joint in Maya, you will notice the parent-child relationship (hierarchy) update when viewing the list of different joints in the Outliner (click on Windows > Outliner). Joint parent-child relationship in Outliner view. This video tutorial explains how to concatenate (join) strings, convert between integers and strings, change text to uppercase and lowercase, and also introduces indexing and arrays. The sample code snippet below shows how to join (concatenate) strings, find the length of a string (the number of characters in a string), convert from integer to string, display specific characters in a string, split a string up and place each word in a separate array element, and convert string to uppercase and lowercase. Don’t try all of this in one go. Have a go at one string operation at a time and only move on to the next one when you feel comfortable to. // Below, is an example of concatention with spaces added between words. document.write(messageArray); // this would return "world!" document.write(message.substr(4,8)); //substr is different to substring. this will show the 8 characters after index number 4.